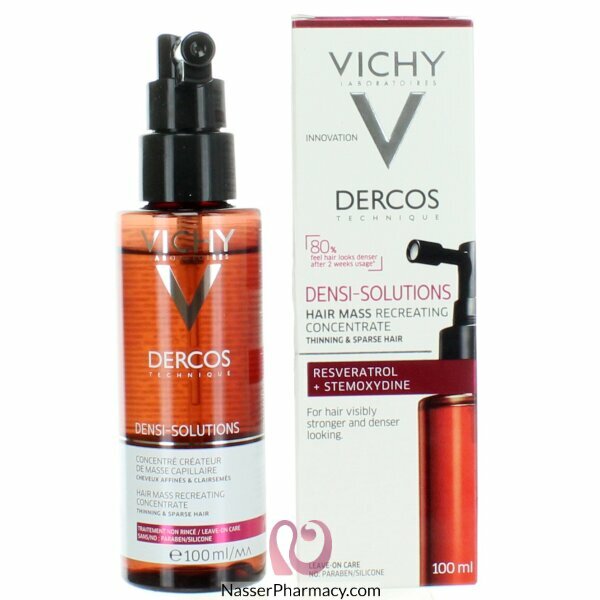 Vichy Dercos Densi-Solutions Hair Mass Recreating Concentrate 100ml is a concentrated scalp care that acts intensely at the root for visibly stronger and denser looking hair with each application. This concentrate is formulated with Resveratrol, a powerful polyphenol derived from a plant of Japanese origin. Known as longevity molecule, it is also used as an antioxidant solution for the skin care. It contains also Stemoxydine, a patented molecule with efficacy clinically proved to redensify the hair. Its fluid texture allows you an easy application on the roots and a fast absorption without leaving any greasy film or sticky residues on the hair scalp. Its formula is adapted for a daily use. From 2 weeks of application, the hair is denser and stronger. Formulated with paraben free, silicon free, dye free. Divide your hair into 4 sections. Apply 5 pressures parts by parts in each section to spread the product on the whole hair scalp. Massage to make penetrate the product and stimulate the hair scalp. Do not rinse. Apply once a day on dry hair during 6 weeks.